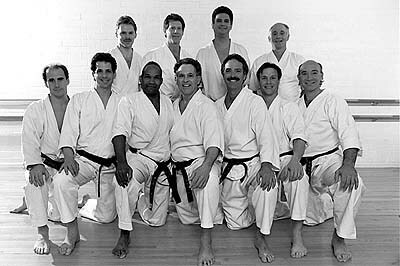 Some of the senior black belt instructors of the Kansas City Shotokan Karate Club. Mike Lyon, yodan (4th degree black belt), has been the director of SKA's Midwest Region since appointed by Mr. Ohshima in 1988. After boxing as a child, he began jiyu-jitsu training at the University of Pennsylvania in 1969. Mr. Lyon began serious study of martial arts under Jon Beltram in 1984. In 1989, Mr. Lyon won the 2nd place medal for team kumite at SKA's annual Nisei Week championship in Los Angeles. In 1991, he won 1st place for black belt kata at the SKA's Midwest championship tournament in Chicago. A few weeks later, he was selected to demonstrate jiyu-ippon kumite at the 60th Anniversary of the Waseda University Karate Club in Tokyo, Japan. Mr. Ohshima awarded him the rank of yodan (4th degree black belt) in June of 2003. Mr. Lyon founded the KCAI dojo at the Kansas City Art Institute in 1988, and the AT&T dojo in 1994. He led practices at both dojos until June of 1999 when he passed leadership along to two of his students, Sarah Oliver and Tom Peacher, who had been awarded the rank of nidan (2nd degree black belt). Mr. Lyon was awarded SKA's Midwest Member of the Year for the in 1988 and 1999 and SKA National Member of the Year for 2003 and 2008. Ten of his direct students have been awarded black belt rank.